Photo story: Turkey with Yasmin Mund — SLOW TRAVEL MAG. Yasmin says: "It’s called ‘Pigeon Valley’ because of pigeon homes carved into rock along the valley. Pigeons used to be used as messengers, their poop used as fertiliser in Turkey." 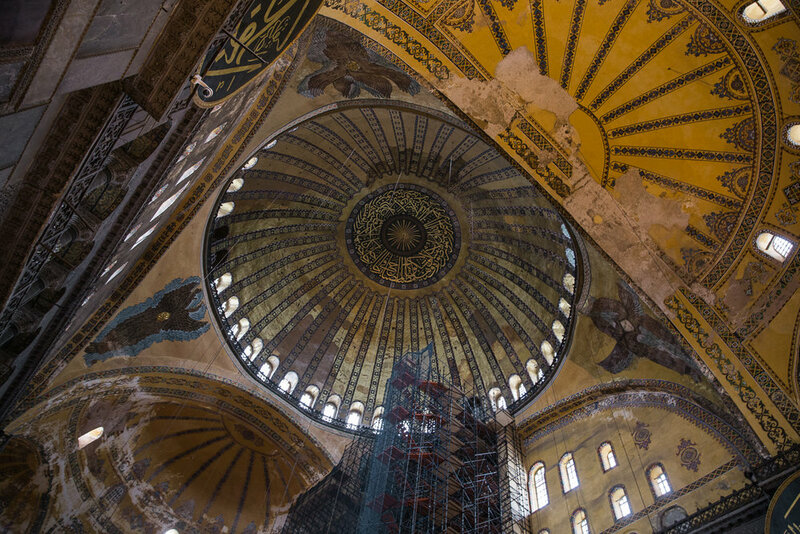 Yasmin says: "The exterior of Hagia Sophia is stunningly colourful. In October the leaves were starting to turn, almost matching the colour." Yasmin says: "This is the roof of Hagia Sophia. It was originally built in 532 and served as a Christian Church, Catholic Church and a Mosque over its life. It was quite a strange sensation seeing Christian mosaics on the walls of this magnificent building in a Muslim country. Maybe it is the mix of beliefs that have been practiced there that add to its beauty. It is currently under construction and open to all as a museum." Yasmin says: "Cats and rugs, roadside in Göreme." Yasmin says: "This boy showed me around his Boss’s property, climbing through caves and tunnels. He was surprised I kept up with him and was so eager to explore. This chicken had escaped the coop. He caught it so easily and returned it." Yasmin says: "I was taken to Ramazan’s father's property to photograph it for his website. It was one of the best experiences I had in Turkey. Not only was the property absolutely stunning, it was filled with vegetables, fruit trees and chickens all in a valley surrounded by rock that also had many caves. These were the smallest apples I’d ever seen." Yasmin says: "Everywhere you travel in Turkey there is always freshly crushed pomegranate juice readily available to buy. It was one of my favourite things because in Australia pomegranates are considered a ‘luxury’ fruit in some ways as they are usually quite expensive." Yasmin says: "On my very last day in Istanbul I ventured over the water to visit ‘Asia’ (there are two sides of the city separated by water ‘Asia’ and ‘Europe’). It was perhaps my preferred ‘side’ of the city with fresh produce markets, unique shops and a slightly more relaxed vibe." Yasmin says: "This was taken on the ferry ride from the European side of Istanbul to the Asian side." Yasmin says: "Rooftop in the amazing city of Istanbul."